William Nathaniel Owen (later known as 'Bill' Owen) was born on 19th April 1896 in Liverpool to William Charles and Mary Owen. He was the only son of seven children. When William Nathaniel was christened on 10th May 1896, the occupation of his father (William Charles) was given as 'Book-keeper'. William Charles became a supplier of hopsack for agricultural products. Later during the First World War, there was a huge demand for hopsack to provide sandbags. By 1911 Bill was living at Fishpond House, Rainhill with his parents and six sisters, Ethel, Florence, Edith, Ruby, Elsie and Doris. Bill’s brother-in-law Nathaniel Pye was also living with them. Bill enlisted into the Royal Horse Artillery in January 1917 and was mustard gassed in the British trenches (sometimes lined and protected with sandbags) in France. On return to England, Bill was sent to Wales for convalescence. His father purchased Pentramawr Farm in Dyffryn Wales in 1918 for him to benefit from outdoor work. 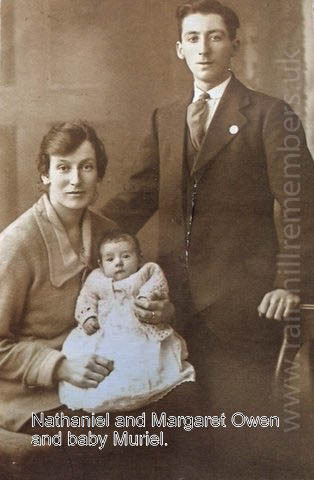 While he was working there Bill met Margaret Davies, who was to become his wife in 1920. 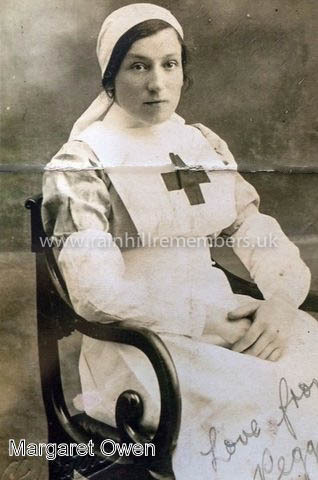 Margaret worked as a VAD nurse in Barmouth. Bill Owen and Margaret, known as Peggy by friends and family, moved to Rainhill. Bill bought Blundell’s Lane Farm where they lived and farmed until his death on 31st August 1953 in Whiston Hospital. He was interred on 3rd September 1953. ​Daughter Muriel now lives in Stoney Lane. ​Bill and his father are buried in St Ann’s Churchyard. Bill left £6845, 5 shillings and 4d. Probate was granted on 6th October to Alan Aizlewood, Chartered Accountant. Information supplied by Muriel Hughes (nee Owen) and Victor Owen (great grandson of William Charles).